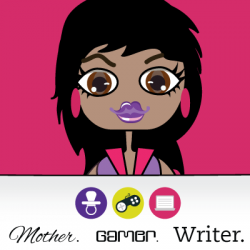 Originally Reviewed At: Mother/Gamer/WriterRating: 5 Controllers Review Source: PublisherReviewer: MeI cannot start this review without first saying, OMG. Yes, page after explosive page I found myself screaming OMG aloud and at the top of my lungs. I feel like I’ve been sent on a crashing plan ride and Jus didn’t even bother to warn her passengers about the dangers of flying on the Denazen airline. 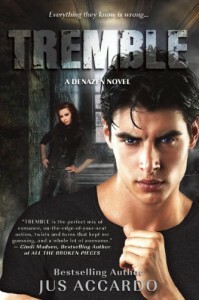 Just as I adored Touch the first book in the Series, I am also swooning over Tremble. The story begins shortly after book two, Toxic ends. We’re introduced to a surly Dez reeling from Kale’s decision to sacrifice himself in order to save her life. Slowly dying because of the Six trials and emotionally beaten down by the loss of Kale, Dez’s life is quickly taking a nosedive into oblivion. *Cries Cries* Her friends attempt to loosen her up a bit and give her a night of fun. What should be a familiar trip back into old Dez territory, leads to a shocking sisterly reunion and a heartbreaking one when – OMG – Kale shows up at the party. Kale doesn’t realize who Dez is, or remember any of their time together. All he knows it that Kiernan (Dez’s sister) is the object of his affection and Dez (who in his mind is Kiernan) is someone he wants to hurt for destroying his entire world. Sounds a bit confusing eh? We’’ it’s not in the land of Supremacy. Because of a Six’s ability, Kale’s memories have been rewritten so to speak and now everything he believes is a lie. The Kale we all fell in love with is now nothing more than a shell of a person full of hate with powers that are ready to kill anyone in his way. Unfortunately, Dez cannot do anything about Kale’s situation because as they quickly learn, his powers have grown and make him almost unstoppable. *tear* In the meantime to take her mind off her Kale problems, Dez works with the other members of the Underground to find other Supremacy kids and alert them to the coming danger. However, the Underground are not the only ones looking to get their hands on Sixes, Denazen is hot on their trail too. The thing I love most about reading a Jus Accardo novel is the action. One emotional action packed moment is always followed by another, and another, and another, and another until all you have is an EPIC adventure cemented in angst, powerful writing, and characters you will hate to love, love to love, and love to hate! AH, I adore me some Dez. She is so raw and never deviates from her true self. Despite her hardships and everything she’s had to endure, she still remains the loyal, quick-witted, brave, spitfire girl from the first novel. Kale though, gosh I just wanted to cry during the first half of the book. He was pretty ruthless and dang near broke my heart with how awful he was being to Dez. Still though, I love him and was rooting for their relationship the entire time. Overall, I can’t say much about the book without giving away spoilers so I will just end this review with nothing but the highest praise. If you haven’t had the chance to read Touch or Toxic, I suggest you do so before picking up Tremble because the emotional journey truly is EPIC and will probably give your heart palpitations late into the wee hours of the night.